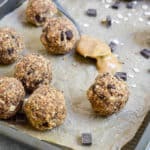 Peanut Butter Protein Energy Bites made with oats, dark chocolate chips, chia seeds and flax! A great source of protein, fiber, and healthy fats. They’re perfect as a snack or breakfast on the go. Filling, require no baking, healthy, and delicious! 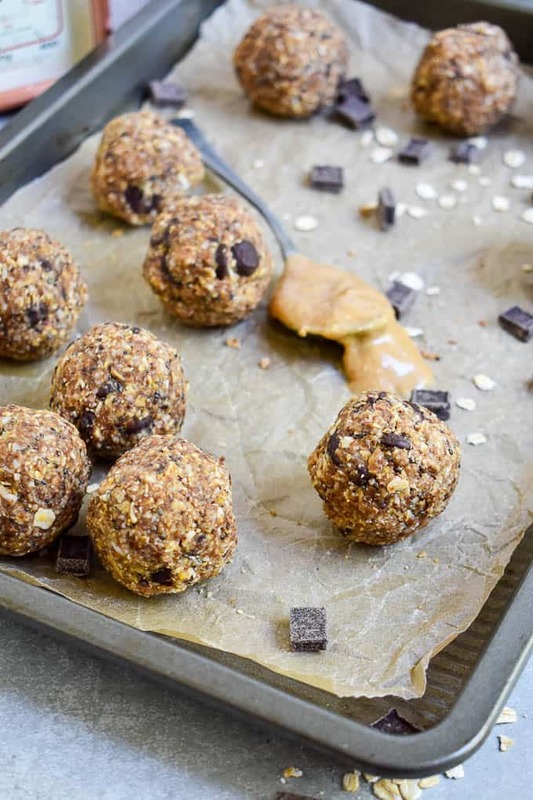 These peanut butter protein energy bites are known as many things: protein balls, power bites, energy balls, etc. 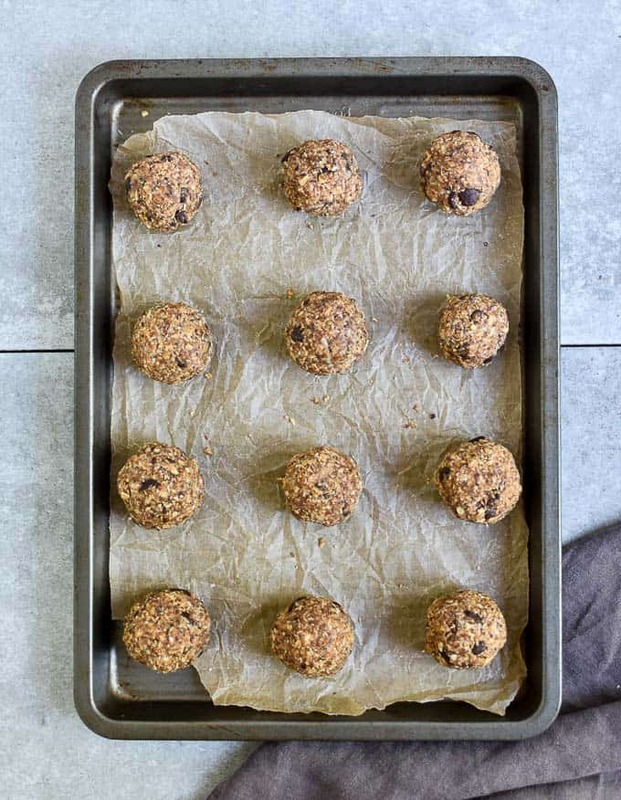 There’s a crap ton of recipes for energy balls on the internet, but this one just happens to be my favorite. Look, I love variety as much as the next guy, but keeping it simple is always best. How simple? No baking, less than 10 ingredients and 10 minutes of your time. That’s how easy! Shall we? 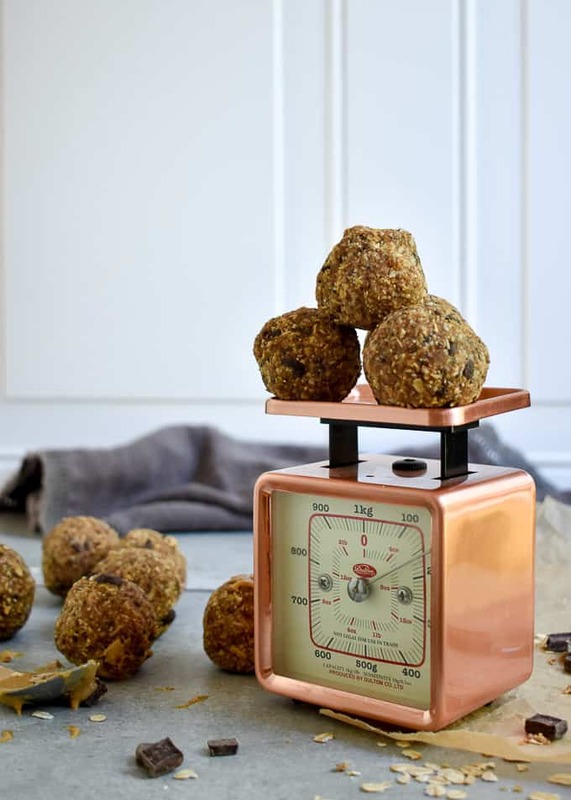 Oats and peanut butter make up the base for the peanut butter protein energy bites. Why? Oats are filling, super healthy, versatile and cheap. I love Bob’s Red Mill Organic Oats. Next, it’s all about the extras. And, as long as they’re healthy preferences you can’t go wrong. But, here is what I chose. I used coconut, non-dairy chocolate chips, some maple syrup, and a little splash of vanilla for my flavors. And, for the “super food” add-ins I used ground flax and chia seeds. Flax and chia are super healthy and a great source of Omega-3’s, protein, and fiber. 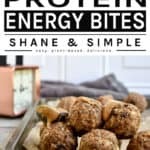 No doubt these Peanut Butter Protein Energy Bites are a great midday snack for adults. But, they’re even better for kids. What happens when you take your kids shopping and they get hungry? It has the potential to be a miserable time. But, there’s no need to worry. Just keep a few of these on hand and problem solved. You’re welcome. 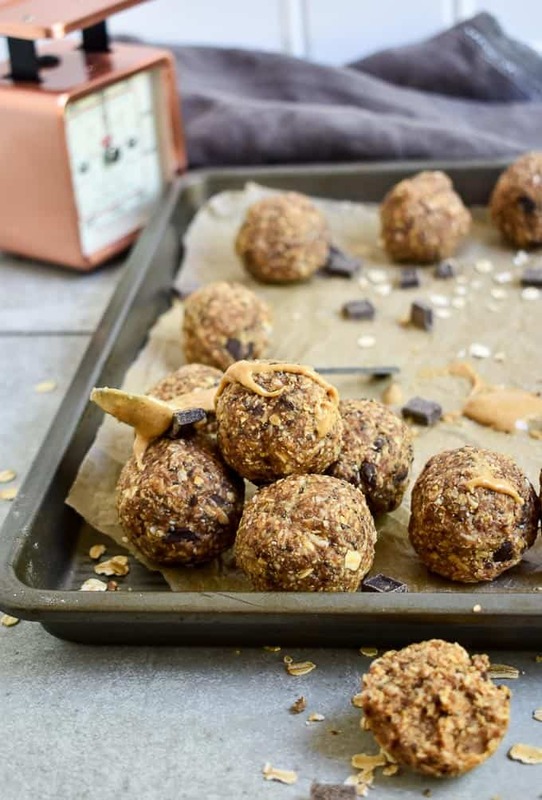 Here are some more delicious, peanut buttery, and healthy snacks you and your kids will love! Try my Grilled Peanut Butter Banana & Jelly Sandwich, Chocolate Peanut Butter Hummus, and No-Bake Chocolate Peanut Butter Pie! 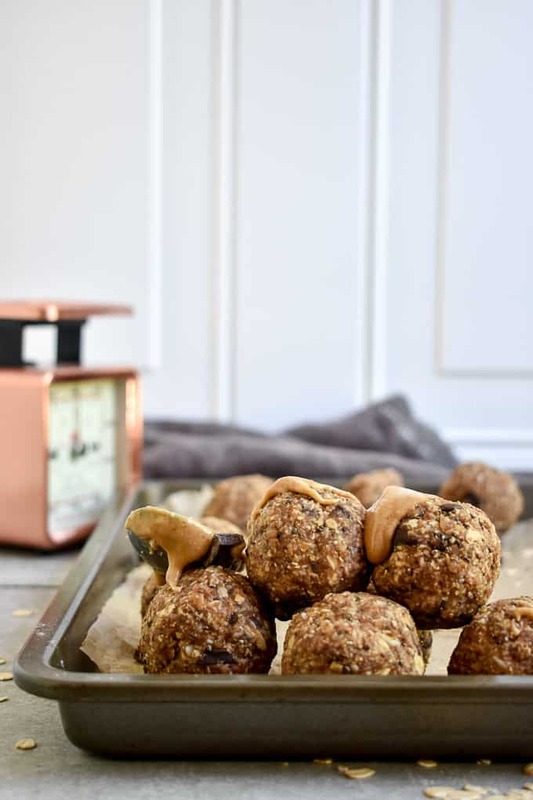 Peanut Butter Protein Energy Bites made with oats, dark chocolate chips, chia seeds and flax! Great source of protein, fiber, and healthy fats. Blend until the oats are chopped and a dough is formed. Usually about 30 seconds. Scoop out 2 Tbsp. of the mixture and form into a ball. Set on a cookie sheet lined with parchment paper. Chill in the fridge for about 30 minutes or until ready to eat. Can be kept in the fridge up to a week. Simple and delicious. The kids love them. These are wonderful. I ended up with 18 but that is because I used my hands to form them and that was the best size for my hand. My kids and husband love these. Awww. So glad you all enjoyed them. Thanks so much for sharing, Sandra! Peace. Hey Shane do you know the calorie content ? Hey Dave, yes. There’s a nutrition label below the recipe. It’s about 200 calories per ball or 2 Tbsp. And if you don’t have a good processor or refrigerator? No worries. Just toss everything in a bowl and mix together by hand. The oats don’t “have” to be chopped. Should work just fine. Just cover and store and room temp. for a couple days. Should be good to go. Yes, if that is your preference. By all means. Well, HELLO Denise from Virginia! Thanks so much saying “HI!” If you plan on eating them today I would just leave them out, but if you made them to keep over a couple days, I would store them. Fantastic recipe. My family does not always appriciate eating vegan but this was a home run hit!. I am now on the hook to double the recipe every time I make it because their only complaint is that I don’t make enough! This is loved by kids and adults! Renee, that is fantastic! Thanks so much for sharing and I’m so glad you enjoyed the recipe. Peace. Fantastic recipe, loved by both kids and adults in our home. My family does not always appriciate eating vegan but this was a home run hit!. I am now on the hook to double the recipe every time I make it because their only complaint is that I don’t make enough! I made these except with almond flour instead of shredded coconut and they tasted great.